Among my many quirky cameras, this is definitely in the top 10. The EEM is a tiny point and shoot camera made for Kodak Instamatic 126 film back in 1967. Using the text, charts, or images on this website without permission on an ebay auction or any other site is a violation of federal law. Amazingly, my little EEM that I picked up at an auction as part of a larger lot in 2003.02 still works! I put in two AA batteries and the thing fired up. The meter amazingly still responds to light. The aperture automatically opens / closes depending on the light value. The motor drive for the film/shutter still works. I'm pretty flabergasted as I'm pretty sure this camera hasn't been used in at least 25 years. Wow. That's longetivity. Kodak Instamatic film was the APS film on the 1960s. 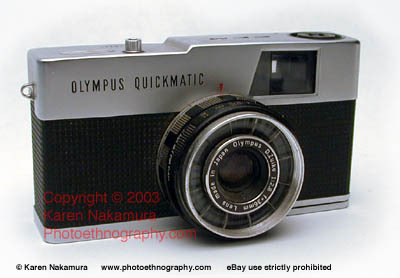 It was sold well into the 1990s until 1999 when Kodak discontinued it. There are still a few vendors on the web who sell 126 film, so it pays to search around. It appears as though the aperture derives its power from the silicon cells that surround it. Even without batteries installed, the aperture responds to light and opens/closes correspondingly when the shutter button is half pressed. Quite neat. Using the text, charts, or images on this website without permission on an ebay auction or any other site is a violation of federal law. The camera uses zone focusing. Although it has a focus scale, really you focus using the "Head and Shoulders" "Family" or "Mountain" logos that appear automagically in the viewfinder. The viewfinder has marks for parallax correction. It takes flash cubes. I see flash cubes at yard sales from time to time, I should pick up some and give them a try. There aren't many sources for 126 Instamatic film. The Frugal Photographer and Film for Classics both have Instamatic 126 film. And Andrew Redding let me know that www.photosupplies.co.uk also has some. Kathleen Fisher wrote to me saying that she has a supply too: http://camerafanplastic.blogspot.com/. Copyright © 2006 Karen Nakamura / Photoethnography.com. Use of this chart, text, or any photographs in an eBay auction without permission will result in an immediate IP violation claim with eBay VeRO. Violators may have their eBay account cancelled. Last modified: Thursday, 11-Mar-2010 00:59:27 EST , [an error occurred while processing this directive] .